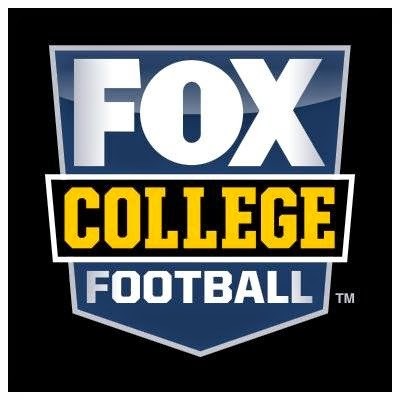 The 2014-15 college football season is coming in hot and with that in mind, we now have the commentator crews for Fox's college football coverage for this fall. And there have been some wholesale changes made to both the broadcast crews and the studio show as well. Let's take a look. Once again, the lead announcing crew will be Johnson and Davis, who will be joined this year by McGrath, the co-host of America's Pregame. Johnson has his fair share of supporters and detractors, I for one don't love him on football but nobody can deny his excitement. One of the newcomers is Davis, who is one of the youngest national broadcasters at 26, who joins from ESPN, and he will team with holdover Harrington with Budden roaming the sidelines. Davis is pretty solid from what I have seen and while Harrington is nothing special as an analyst, he at least is better in the booth than he was in the studio. The highest profile newcomer is Brando who will work games with Klatt on Thursdays and a partner to be determined on Saturdays. Brando was a good get as he helps lend some credibility to both Fox's college football and college basketball. While he is better in the studio than in the booth in my opinion, he is a solid football announcer and should make for a strong crew with the excellent Klatt. Bolerjack returns as well and folks will know that I am no fan of his work. He will team with Nece who worked the sidelines a year ago for Fox with Bolerjack and Harrington. You will not see Justin Kutcher's name on that list but he will be doing both college and NFL games this fall. His profile is growing at Fox and he always calls a good game. After their pregame show got trounced in the ratings by College GameDay, something that shouldn't really surprise anybody, it looks like Fox is pulling the plug on the Saturday morning pregame show altogether. Of course, their program never had a chance head-to-head, even though it was a solid program. But with Erin Andrews, who wasn't a great host, heading to the NFL full-time, it became clear that changes were coming and the Saturday morning will be scrapped altogether. Honestly, I would have kept an hour or half-hour show to lead into their coverage (similar to what CBS does), but it looks like Fox will go in a different direction altogether, particularly with Bundesliga soccer coming in 2015. Instead, Fox will air a one-hour pregame show prior to their Saturday night game on the network that will be hosted by Rob Stone with Klatt and Dave Wannstedt (!) with contributions from their insiders Bruce Feldman, Stewart Mandel (both high-profile additions to their website) and Richard Deitsch's good friend Clay Travis. Petros Papadakis, Coy Wire, and rules analyst Mike Pereira will contribute. Hey I don't really care who the announcers are but come on can they call the game and not be talking about bs that isn't even going on! its very hard for my blind friends to follow when you don't tell what's going on! come on fox get with it! I am trying to watch the ducks game and these announcers aren't telling us anything. close your eyes and tell me what you can figure out very confusing! I am not impressed with Tim Brando at all!!!! He is so one-sided and makes me want to smash my tv when he talks. Are there any Fox commentators that are not so obviously opposed to California sports teams or do we need to become a red state to receive better treatment?